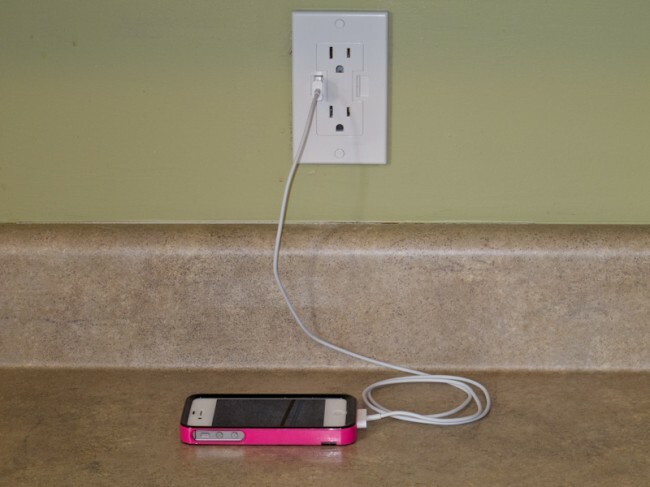 With so many things now a days relying on a USB connection to deliver power and so many different companies putting out proprietary wall plugs to plug your USB cables into, your house could end up becoming littered with plugs (as mine had). While there is no solution in sight to the problem of different proprietary ends that actually connect to your device, NewerTech has come up with an interesting idea for the problem of being plagued by too many plugs. When you first see the Power2U unit, you can recognize the genius behind it and wonder why it took so long to be created. However having good looks doesn't mean it will work as intended, or that it will even be worth the hassle of installing – so is the Power2U right for you and your house? Read on to find out. Quick Editor's note here – while the Power2U can be installed in an existing power outlet, I happened to be remodeling my kitchen. This means that I installed the Power2U in "new construction", so I can't really comment on how easy it is to put into "existing construction". I assume that it really is not that much different, but just know you might run into some different issues that I did not. Really though, if you know anything at all about electrical work, this should be a breeze to put in. 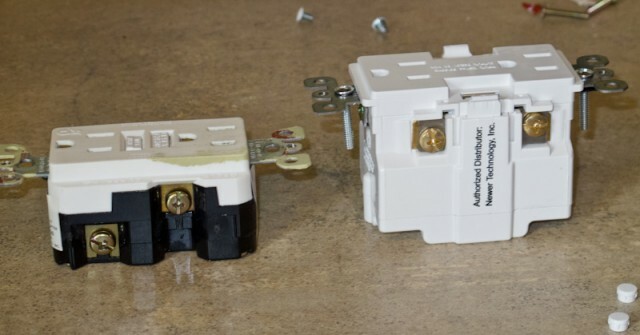 ALWAYS remember to shut off your breaker before putting it in though, while 110 might not kill you, it can sting a bit. Now as I said earlier, the Power2U is a really nice solution to having a permanent charging dock for USB devices. It replaces a standard outlet, and you don't actually lose that outlet when you install it. Rather than taking away plugs (which are vital for livability in pretty much every house and office), the Power2U keeps two three pronged outlets (unfortunately not GFI though) and puts two USB ports right beside them. The documentation that comes with the Power2U claims that it sends enough juice to the USB ports to power or charge four different things – so I guess if you had a expansion box for more USB devices it would work, I didn't have one available though so I only ever had two things plugged into it. I will say that it definitely works as intended. I was able to charge an iPhone and a Galaxy Tab at the same time, and it charged them in the same amount of time as if they were being charged by their normal wall plugs. When installing the Power2U there are a few things to consider. 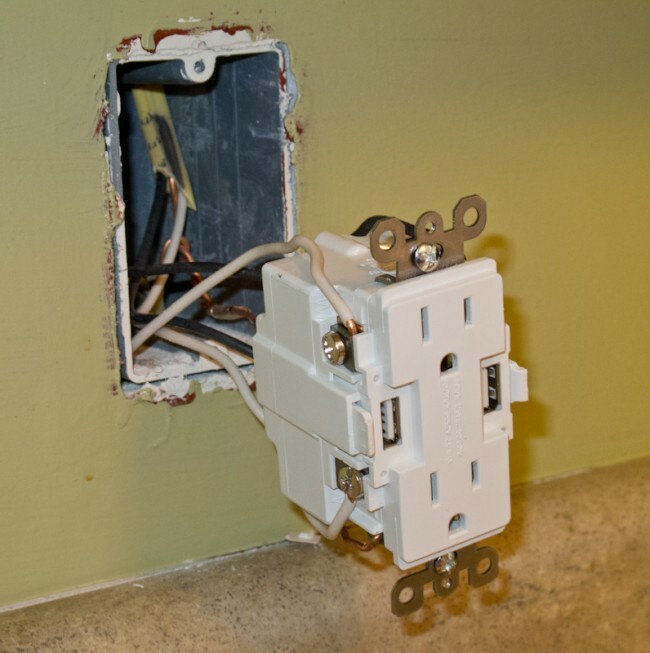 First, it is much larger than a normal outlet – your box has to be at least sixteen cubic inches. Second, if you are like me and used to quick connections, forget they even exist; the Power2U makes you use the old fashioned way of wrapping your leads around terminals and then tightening a screw. 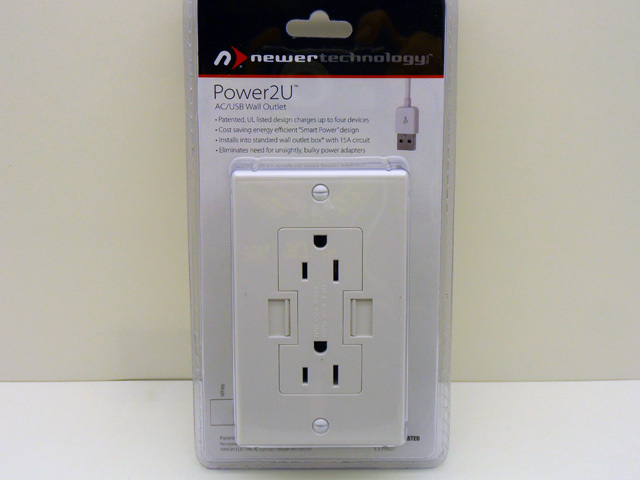 Lastly, you can NOT install the Power2U in anything other than a single outlet box. That means you can't put it in the same box as a switch. This is because the cover for the Power2U is a custom cover, and you can't go down to your local Lowe's or Home Depot and find another cover with a switch hole in it. This also means that you have to consider where you are placing it because you aren't going to be able to get a vanity cover for it. 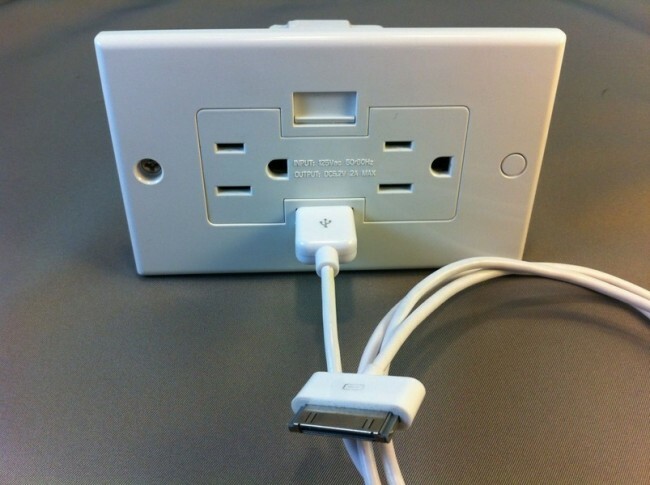 Now you can get plugs with USB outlets in them for cheaper, but those are boxes that have to plug in to existing outlets – they are not permanent fixtures. I have a husky, and the oaf broke a plug off in an outlet before – the same thing could happen with those plug-in models. At least with this there is no worries about things like that happening. The Bottom Line: Even though there is no option for other plate stylings right now, rest assures that this product is the wave of the future; I can very easily see these going into all new construction in the next few years.